This Short Update describes events occurring in Kyonedoe Township, Dooplaya District during February 2014. 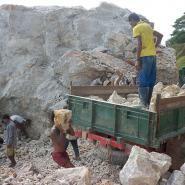 It includes information regarding stone mining in A--- village that is currently causing problems for the villagers. 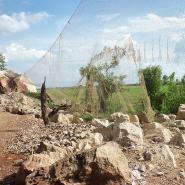 Stones from the mine have been scattered on villagers’ farmland, injuring their work animals and adding additional costs to the planting process. Although villagers reported the incident to the village administration, the case has not yet been investigated. The following Short Update was received by KHRG in February 2014. It was written by a community member in Dooplaya District who has been trained by KHRG to monitor local human rights conditions. It is presented below translated exactly as originally written, save for minor edits for clarity and security. This report was received along with other information from Dooplaya District, including four interviews. Subject: Stone mining at the rock hill [stone deposit] in A--- village [area] is causing the destruction of surrounding farms, harming the [land owners]. 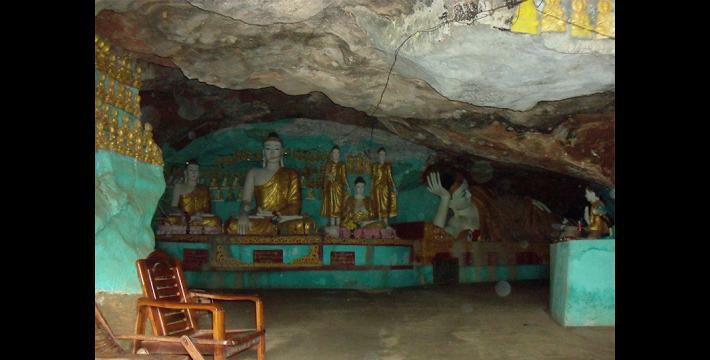 The subcontractor U Thu Taw, [also known as] U Tin Moe Aung, was also the boss of workers from the original [stone mining] contract with U Han Win Aung in the A--- village [area]. 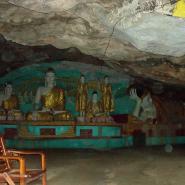 Since the day he [U Tin Moe Aung] started conducting his work, our land and farms have been ruined. [This has been going on] for two years now. It is very difficult to harrow [the land] because there are small pieces of rock from the rock mine that have fallen down onto [the villagers’] farms that they are working on. Some stones are too big and it is difficult to remove them from the farm. In our region, most farmers harrow [their fields] with cows. The sharp pieces of rock injure them and we can [no longer] use those [injured cows]. We [then] have to borrow cows from others. When the [borrowed] cows were injured again [from harrowing], we had to pay compensation for the injuries quite often. This also caused arguments between the cow owners and the cow leasers because the cows injured their hooves, which is the most difficult part of the cow to heal. That is why this problem often causes arguments [between cow owners and cow leasers]. In addition, [the villagers tried] hiring a tractor to harrow the farmland but the tractor [owner] became fed up and left after [only] harrowing in one area because the hard pieces of rocks ruined the [tractor’s] ploughshare. During the paddy planting season the sharp pieces of rock also injure the harvesters’ hands and legs. In our area, we traditionally practice hand planting but now it is too difficult to hire females because [if anything happens to them] the money they earn will not cover the money that they will have to spend for medical treatment. The farmers in A--- village [also] dug water irrigation canals around the farm. The practice of digging irrigation canals is an old farming technique. The canal is usually three feet deep and two feet wide. 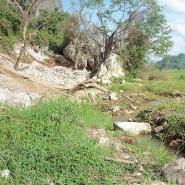 [However], U Tin Moe Aung filled the canal with rocks and uses it as a road. 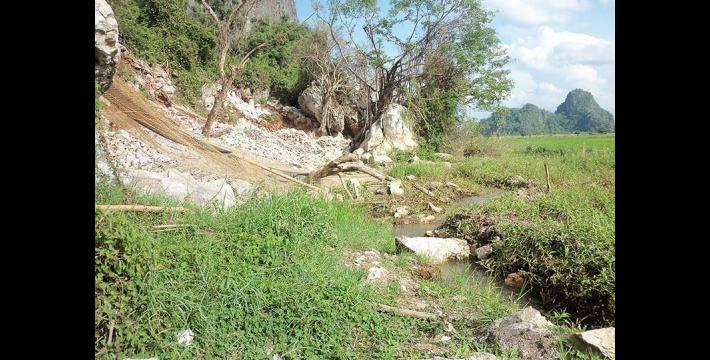 [Therefore], the farms lost their water supply and the farms' normal rice production has decreased. There is [also] a natural hot spring near the stone mine. The farmers are dependent upon the hot spring as they let the water [from the hot spring] flow down to the pa yin pa ta farm and use the water [there]. Now, they [stone miners] filled the hot spring hole with rocks and use the area as [a spot] to pile the rocks. The place is filled with rocks and no more water comes out of [the hot spring]. It has become a rock stockpiling location. There are 300 acres of farms facing problems of water scarcity, [all located in] A---, B--- and C--- villages. 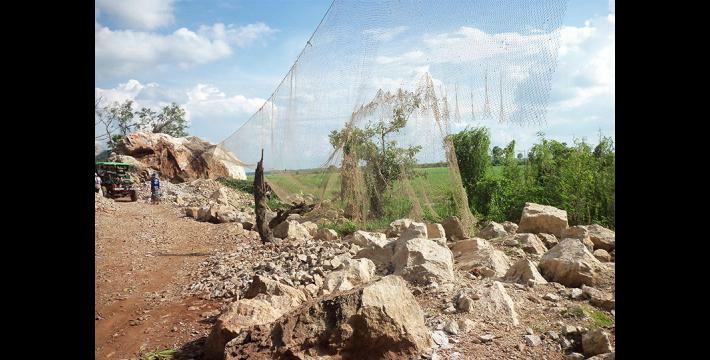 Currently, there are ten acres of land around A--- kyauk taung [rock mountain] that have been ruined for two years as it is too difficult to harrow on this farmland. Now the land has been uncultivated for a long time and it resembles wild land, full of [naturally occurring] vegetation. We are the [type of] farmers who primarily practice farming techniques the same way as our ancestors. That is why we are reporting about it. Regarding the [stone] mining issue, the village administrator and [village] leaders have not [set] a timeline for mining for themselves, so they do mining as they wish according to their needs. We will have to start fertilising the land and harrowing the farm soon after it rains two or three times. If they keep stone mining blindly it will be very dangerous for our farmers. The land is at a low level and they [farmers] have to harrow the land quickly. Since it is lower lying land, when it rains water flows to the land, and the land [becomes] covered with water. It [therefore] gets more difficult to harrow and [build the] raised boundary [bund] around the farm. The farmers [then] have to spend more money on this process. Based on [the information in] this report, some farmers are really upset with farming and have lost motivation [to farm]. Regarding the information above, [villagers] reported [this incident] to the village administrator but it [the abuse] has gone uninvestigated. So [we are now] reporting it to you [KHRG]. The [Burma/Myanmar] government is [meant to be] for the civilians and of the civilians, so we [villagers], with farmers, are respectfully reporting it [this abuse] to you. We kindly request you to help us quickly with this issue. KHRG trains community members in eastern Burma/Myanmar to document individual human rights abuses using a standardised reporting format; conduct interviews with other villagers; and write general updates on the situation in areas with which they are familiar. When writing short updates, community members are encouraged to summarise recent events, raise issues that they consider to be important, and present their opinions or perspective on abuse and other local dynamics in their area. U Thu Taw (a.k.a. U Tin Moe Aung) has been previously implicated in this case by KHRG researchers. In that separate report he was said to have been affiliated with Border Guard Force (BGF) Battalion #1021. 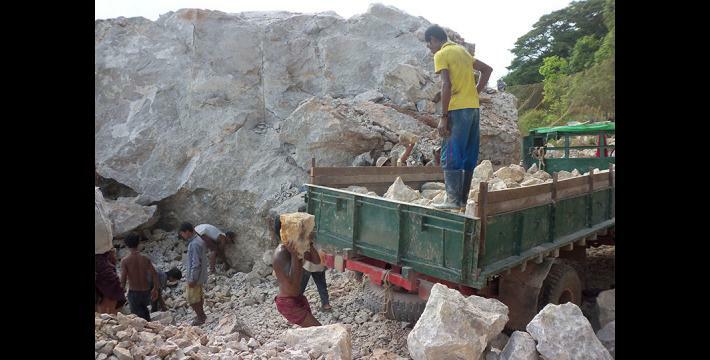 For more information see “Villagers report negative impacts of stone mining on their livelihoods in Kyaik Ma Yaw Township, 2011 to 2014," KHRG, June 2014. Harrowing is a process by which a farm implement, also called a harrow, is dragged over the ground in order to break up and smooth the soil surface. It is distinct from ploughing, which is a deeper and coarser tillage of the land. Harrowing usually follows the ploughing process and precedes the planting of seeds. A ‘pa yin pa ta’ is a Burmese phrase for a particular farm type, in which farming is conducted in either a natural or man-made flooded area. It is a water intensive practice whereby farming takes place on floating vegetation that is otherwise surrounded by water. Different floating gardens are often accessed by small boats.